Ready for the harshest ride. Temperatures are dropping? You are driving on wet, snowy or icy roads? 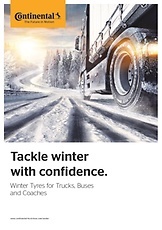 Then it's high time to switch to winter tires – for your own safety and for optimal efficiency. I‘m a driver transporting special gases for BÖRJE JÖNSSON ÅKERI AB throughout Sweden and Norway. Wherever I have to go, I can rely on my Continental winter tires. I remember one situation where the road was suddenly frozen, with ice on the ground and loose snow on top of it. While everyone else was stuck and had to fetch snow chains to get going again, I put my foot on the accelerator and just drove off. This for me says it all. Be it slippery slopes or wintry roads: Winter road conditions will impact your driving and influence braking distance, safety and performance. If you are driving through Europe in winter, you need to be prepared. 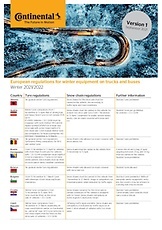 The legal ramifications concerning winter tires and snow chains vary significantly between European countries. To make sure your vehicle is always fitted with appropriate winter equipment, Continental compiles an annual overview of the various regional requirements. My family‘s company has been transporting wood chips throughout Sweden since 1940. We have tried other winter tires before but ever since we mounted Continental winter tires about 8 years ago, we have stuck with them. During wintertime you have that one situation every day where you just need maximum traction like in uphill starting situations. And then you know you have got Continental winter tires. 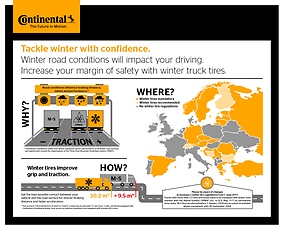 Learn why you need winter truck tires with our infographic.